Today, seventy-three years after his death, journalists still tell tales of Charles E. Chapin. As city editor of Pulitzer’s New York Evening World , Chapin was the model of the take-no-prisoners newsroom tyrant: he drove reporters relentlessly—and kept his paper in the center ring of the circus of big-city journalism. From the Harry K. Thaw trial to the sinking of the Titanic , Chapin set the pace for the evening press, the CNN of the pre-electronic world of journalism. In 1918, at the pinnacle of fame, Chapin’s world collapsed. Facing financial ruin, sunk in depression, he decided to kill himself and his beloved wife Nellie. On a quiet September morning, he took not his own life, but Nellie’s, shooting her as she slept. After his trial—and one hell of a story for the World’s competitors—he was sentenced to life in the infamous Sing Sing Prison in Ossining, New York. In this story of an extraordinary life set in the most thrilling epoch of American journalism, James McGrath Morris tracks Chapin’s rise from legendary Chicago street reporter to celebrity powerbroker in media-mad New York. His was a human tragedy played out in the sensational stories of tabloids and broadsheets. But it’s also an epic of redemption: in prison, Chapin started a newspaper to fight for prisoner rights, wrote a best-selling autobiography, had two long-distance love affairs, and tapped his prodigious talents to transform barren prison plots into world-famous rose gardens before dying peacefully in his cell in 1930. The first portrait of one of the founding figures of modern American journalism, and a vibrant chronicle of the cutthroat culture of scoops and scandals, The Rose Man of Sing Sing is also a hidden history of New York at its most colorful and passionate. 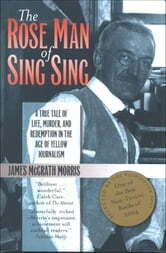 James McGrath Morris is a former journalist, author of Jailhouse Journalism: The Fourth Estate Behind Bars , and a historian. He lives in Falls Church, Virginia, and teaches at West Springfield High School.